It’s been intentionally rigged by use of corporate bribery of Congress, and by discussing wage income as “somehow” magically being “different” from investment income. There is zero logical difference in where your $$$ come from. The real reason that wages are taxed at a higher rate than investment income is that the bulk of income for most wealthy folks comes from investments… and they’re the ones who purchased this “favor” from Congress. Now, we need to be very careful to define terms precisely because there is an absolutely incredible amount of lying by statistics going on in discussions about this subject. What the O.P. and I (and most non wealthy Citizens) are talking about here is Taxes actually paid as a percentage of gross income. This is called the Effective Rate. What the folks attempting to “justify” the current (bought and paid for) tax system usually talk about are Marginal rates (the highest possible rate, if your accountants and tax attorneys are grossly, and criminally negligent) , and Gross Collections as a percentage of total Collections. ​That ultimately “gave” us this..
(Hint… that’s not dollars trickling down your legs…) the most extreme income and wealth inequality since the late 1920’s. Yes folks, it’s going to implode again! The so called “justification” for having a reduced tax rate on investment capital gains is that it supposedly entails risk. That’s a lie. It’s a blatant lie because there’s no risk. They use other people’s money, if they win they get to keep all the profits, and if they fail We The People “get to” foot the bill for all the costs of that failure! Consider the 2006 bank bail out. If it did show the latter, with the effects of local taxes the rankings would be reversed; with the bottom three quintiles paying (by far) the highest percentages in taxes as a percentage of gross income. Conveniently, and “most carefully” no one in government even looks at those real life numbers. 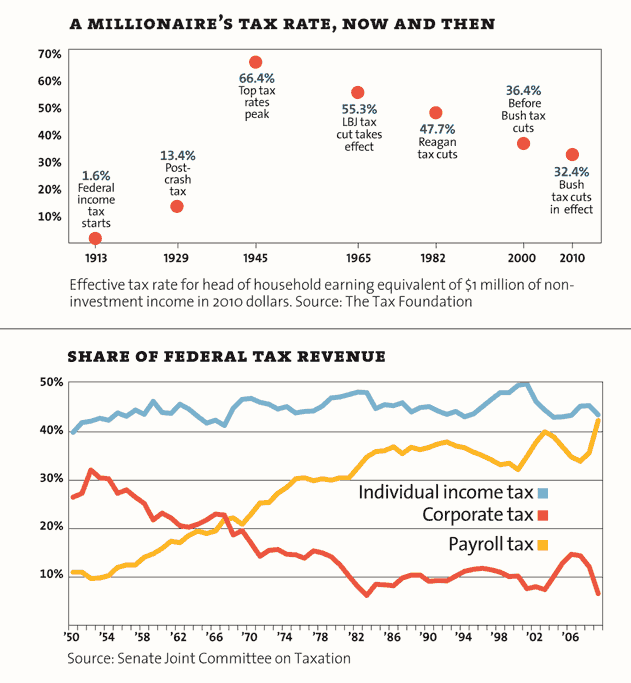 And yet in our “progressive” tax system the wealthy and multinational corporations, pay less than half the rate of taxes that the working poor, and middle class pays when considered as a percentage of gross income; for the simple reason that the marginal rate which affects the wealthy most is the 15% on investment income and not the 45% on wage income. Also, many if not most, wealthy folks are incorporated, and thus get to deduct almost everything as “business expense” while the working poor and middle class are actively prevented “by declaration” from deducting the bulk of their largest expenses (housing, transport, medical care below 5%of gross, utilities, etc). ​See that “flip” between corporate tax collection and payroll tax collections? Welcome to the “new” old serfdom by obfuscation! Note: That stuff trickling down your legs…? It’s not money!